Microchipping is a simple procedure that greatly increases the chances that your pet will be returned to you should he or she become lost. Having your pet microchipped is one of the best ways to increase your pet's chances of getting home if he or she is lost or stolen and winds up at an animal shelter or veterinary office. Unlike dog tags and collars, which can fall off or be removed, microchipping is a more permanent form of identifying your dog or cat. Make sure your pets can find their way home…microchip them! A tiny capsule about the size of a grain of rice is injected under the loose skin on the back of your pet's neck. The procedure provides no more discomfort than a vaccination. Register the chip. This is extremely important! If the clinic where you had your pet microchipped does not submit the paperwork for you, make sure you complete the form and mail it to the company. And even if the clinic submits the paperwork for you, it's a good idea to follow up with the microchip company to make sure the chip was registered correctly. Please remember that you must keep your pet's microchip information up-to-date with the microchip company; if you do not, then the microchip is useless. If your phone number, address, e-mail address, or alternate contact change, call the microchip company and update your information. Keeping your pet's microchip information up-to-date is the only way it can be used to reunite you with your pet. Note: If your pet is already microchipped, but you don't know the company who manufactured your pet's chip, you can type your pet's microchip number into the AAHA Universal Pet Microchip Lookup website. It will inform you of your pet's microchip company and the company's contact information. If your dog or cat becomes lost and turns up at a shelter or vet's office, a scanner can be used to read the digital number on the chip. A phone call to the microchip company to which you registered the microchip provides the shelter or vet with your contact information, and you can be contacted to retrieve your pet. Where can I have my pet(s) microchipped? Low-cost microchipping (and vaccinations) are available for dogs and cats throughout the year at many Petco stores. You can locate a clinic near you at vetcoclinics.com. The Alliance hosts Vetco microchipping clinics at some of our adoption events where you can have your dog(s) or cat(s) microchipped either for free or for a reduced fee. Other organizations also sponsor free and low-cost microchipping at events. 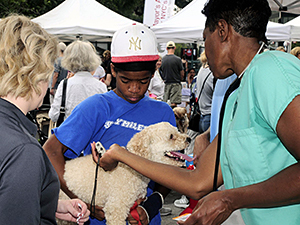 To view upcoming microchipping clinics in the NYC area, visit our calendar. You can also ask your veterinarian or local animal shelter for microchipping advice and prices.